The Constructor based HQL shows you how to create query select new object in hibernate for improving performance. Normally, almost of developer don’t bother retrieving the whole entity with all its properties. While they don’t really need all of them in a particular case. For example, we have a single entity with 25 properties, and we just need a few to display to user. In case, if we execute the query to get thousands of records, the unused fields will make us heavily jamming and lead to a huge performance hit in our application. Reporting Queries just select the used fields so that it avoid the overhead of retrieved entities getting cached in the persistent context. It makes a huge improvement in the performance compared to the traditional retrieval technique with Hibernate. Let’s create example to clarify how Constructor based HQL works. This program will query student data from database by using Constructor based HQL. Here we get the available student with id=33. Hibernate: select student0_.id as col_0_0_, student0_.NAME as col_1_0_ from STUDENT student0_ where student0_.id=? 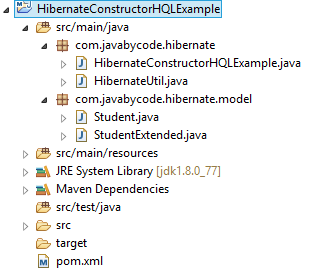 Hibernate: select student0_.NAME as col_0_0_, count(student0_.id) as col_1_0_ from STUDENT student0_ where student0_.id=? As you can see the above program. It’s quite easy to create Constructor based HQL with aggregated values. Noticed that the constructor-based HQL query will return all instances in transient state. It means that it doesn’t return persistent entity instances to the persistence context cache.